In December, IATA held a Global Media Day at its Geneva HQ hosted by director-general Alexandre de Juniac. It was a powerful briefing, with some 15 talks by true experts on many of the subjects that confront all of us involved with air transport, be it as user, seller, operator or aircraft supplier. BTN brings you the full list of presentations (click on presentations and then click on presentations again). Here we precis one that concerns airlines and airports. The presentation on Airport Slot Capacity was delivered by Lara Morgan, IATA’s specialist lead in this area. The piece is a plea for airports to use that magic word ‘Co-ordination’ and is thought provoking. COMMENTS are welcome. Declaring airport capacity is the primary step in the seasonal slot process, but it's being ignored. A capacity crisis is looming. Airport size is a long-term project, but we also need to manage effectively the capacity that currently exists. Regulators are looking for solutions, but we are concerned they're focusing on the wrong area. The European Commission has repeatedly spoken about creating additional capacity in Europe to manage delays by reforming the slot process – radically changing this process is not the solution. The slot procedure does not create capacity – it manages a lack of it! Although IATA’s role in many areas is to urge change, our message on slots is – be extremely careful. The current situation enables airlines to consistently plan schedules and aircraft investment, which allows airlines to meet consumer demand, despite the growing challenge of airport and airspace capacity constraints. The process is facilitating growth, not disabling it. The real issue lies in the lack of time spent analysing the capacity we have and how it's being used. Is there more that could be done? The key is ensuring there's reliable, transparent and regular examination of what the capacity is, and how demand is changing. This is why we are calling on governments, airports, air navigation service providers and airlines to collaborate. Despite limited available capacity at slot coordinated airports, airlines have been using slots efficiently. Airlines are regularly reviewing the markets they serve, the destinations they put larger aircraft on, to make the best use of scarce capacity. They tweak the timing of their services to maximise connectivity through their banks of traffic globally. Unfortunately, they’re also having to decide which routes to operate and which get dropped – because there are not enough slots to satisfy demand. The industry is extremely dynamic in this respect, constantly reviewing what passengers want and what they’re offering. London's two major airports are doing well in this respect. There are airports today that are slot coordinated but they have not reviewed their slot parameters in years. We shouldn’t see flat capacity declarations every day and month – the industry is dynamic, and the use of capacity changes. This image shows some best practice examples of runway use – but it also shows huge differences in throughput (noting these are all fully coordinated airports). Amsterdam for example is a six-runway airport – with the same throughput as LHR, with two runways. Both have government-imposed limits to their annual movements, but clearly one has much more potential to grow with today's existing infrastructure. There are clear examples of best-practice use of the infrastructure, so why are some airports not looking to get the most out of their facilities today, even without costly expansion projects? We don’t have the answer; it doesn’t seem logical that the operator of an airport doesn’t want to make the best of what they have. Is it because privatised airports are happy to allow the airlines to maximize the use of their slots, and enjoy the revenue this provides without having to spend costly sums on new capacity? Is it the regulatory restrictions like movement caps and night bans that prevent any increases? Is it a lack of will to invest time and effort to analyse capacity when the slot process manages the constraint perfectly? Most likely it’s a mix of all of the above. We can do more to meet the need for additional capacity right now. The answer is to conduct a regular, impartial and transparent review of airport capacity, with the aim of making more slots available to meet demand, while balancing resilience and deliverability. The process being focused on is the wrong one – the slot process is the final step in managing the lack of capacity. Before this come many steps to understand the inputs, ensure everything is working efficiently and maintain what should be a well-oiled machine. Then the capacity should be declared for allocating. How do we know this process works? Because there are a handful of airports doing it well. Even with movement caps, they’re tweaking the slot declaration to match demand each season – i.e. making capacity available when passengers want to travel. In the UK, the London airport system is finding small increases, despite the limits of the infrastructure, by working with the airlines, ATC, airports and coordinators, six bringing some 11,000 additional slots into the system for the coming summer. The coordinator's role in the slot process is to take the capacity that’s declared for use, and allocate it to airlines. The coordinator can only allocate what is made available. Unfortunately, that means if the capacity is not reviewed and just stays the same, the slot pool doesn’t change either. If demand changes, why is the airport not reviewing the use of the terminal and runways and finding additional slots for the coordinator to allocate? 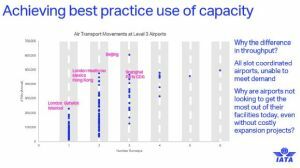 Given that 43% of global passengers now depart from a slot-coordinated airport, it’s vital the process uses all capacity available. The European Commission has spoken about changing the slot rules to get more capacity – instead we are asking for strengthened obligations for coordinated airports to look at the capacity they already have. Use best practice to identify terminal capacity, airspace and runway constraints. Review performance each season and agree with the stakeholders what is acceptable the next season in terms of delay. To get the most out of what we have, this process has to improve – globally. It won’t deliver all the capacity we need, but it will ensure we’re making the most of the capacity already available. There is no one-size-fits-all solution. • Regular review of the demand and capacity situation at each coordinated airport. • Transparent and open discussion about performance, resilience and balancing growth and delays. • Understand the demand and tweak / flex the capacity to match it – this drives the optimal consumer outcomes. • Publish the capacity declaration transparently, so all carriers can use it for their planning – enabling fair access and increased competition, as well as better ability to meet the needs of the travelling public. IATA analysis has shown 30% of European routes are now operated by two or more carriers, an increase of 5% since 2010. Research commissioned by the Airports Council International (ACI) shows LCC in Europe compete on intra-European routes with a 55% share of seat capacity, compared to only 12% 10 years earlier. And that city pairs between Europe and the rest of the world have nearly doubled in 10 years, despite Europe being home to the most slot-coordinated airports. So, if there is a problem with all carriers getting their ideal choice of schedules, the fault lies in a lack of capacity. If there is a problem with access to congested airports, the fault likes in a lack of capacity to meet demand. But there’s a balance: deliverability and operability need certainty of infrastructure. There is no magic solution to achieving growth as we enter a capacity crisis. Of course, the long-term objective is to see timely and cost-effective expansion of congested airports and airspace. The slot process cannot create more capacity, only make use of what’s made available to be allocated. Only through the use of best practice to identify all the possible capacity, can it be made available for more slots to be allocated. This is what will create the opportunity for growth even at today's congested airports. But we say this with a very real need to also understand the deliverability of the capacity – without harming performance. Collaboration is needed to ensure the system can deliver reliable, consistent services and room for growth – airlines, airports, ANSPs and government all need to work with the coordinator to identify room for improvement, however small.